A slender ribbon of shining silver becomes a bracelet by Oscar Figueroa. Crafted by hand of Mexico's renowned Taxco silver, the cuff features an off-center sterling cross. 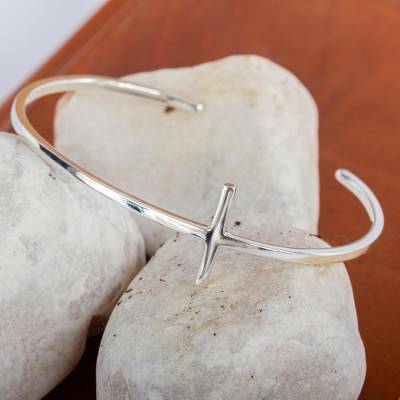 You can find sterling silver cuff bracelet 'Contemporary Cross' by Oscar Figueroa Escorcia in jewelry categories such as Taxco Silver Bracelets, Cross Bracelets, No Stone Bracelets, Silver Bracelets, Sterling Silver Bracelets and Cuff Bracelets. Enjoy exploring these sections for other Novica treasures.